When is busy activity worse than doing nothing? Effective time management skills are not always about doing more. 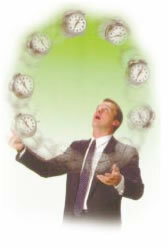 Read about Mark in this time management article to find out why! Mark had a sudden feeling of disappointment. Was all the effort he put into the day just wasted? How important could it be if he didnt even remember. Mark sat back in his chair and noticed it was dark outside. Where did the day go, he thought to himself. Worse, he couldnt remember what he had done today. It had all become a blur of activity, adrenaline and stress. This came as a shock to Mark. He had recently started the time coaching program and this week he had agreed to stop and reflect on the day before he went home. This was something new for Mark. Usually he would rush out the door at the end of the day and try to get home as quickly as possible (mostly because he was at work later than he wanted to be). He would come in to work early the next day and get right in to it. Emails, messages, requests from other people. Mark thought he was pretty organised. He had done several time management courses and was aware of the things he should do to manage his time. He used a to do list and planned his appointments. This was the first time he had ever stepped back to reflect on his day. His feeling of disappointment turned to sense of failure. Perhaps he wasnt as organised as he thought. What had his coach said about effectiveness at work? Effectiveness is the extent to which you move closer to your desired result. Marks coach had used the analogy of a marathon runner. A runner that takes a wrong turn and goes in the opposite direction is still working hard, like the other runners. But running in the wrong direction is not getting the runner closer to their desired result, the finish line. Had he been running in the wrong direction today? When is busy activity worse than doing nothing? When the activity you are doing does not get you closer to your desired outcome. Just like the runner going in the wrong direction, you might end up further away from where you want to go and then you have to work harder just to catch-up. We see this every where we go. And its getting worse. Most work environments have massive distractions that stop you getting closer to the outcome you want. You have to take responsibility, take charge and consciously reject the requests that do not get you closer to your key outcomes. This is hard for most people for several reasons. The first is that most people are not clear about the top 5 Key Results Areas for their role (that is another story in itself!). The next major factor is that you get used to being driven by the requests that come to you. Are you busy running in the wrong direction? What Is Effective Time Management? What are my main goals? What are your top 3 KPIs at work? You need to know the area AND the specific target you need to reach. What are your 3 KPIs in your life outside work? How will you know when you will reach them? Being still and reflecting on your direction is much more effective than running very fast in the wrong direction.